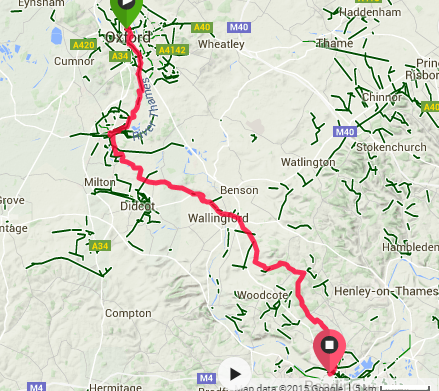 So, much of our journey was pieced together from Sustrans routes 4 and 5, and yes, we did straighten out some of the wiggles in the river, but we did visit, or pass through, many of the principal towns and cities on the Thames. It has to be said that following a river from its still-dry source, seeing it gather size and volume as the journey progresses, and observing how the river integrates into the lives of the people who live along its banks……..in miniature, it’s a journey through life itself. It has a beginning and an end. It goes from conception to birth, through its infancy and childhood to adulthood, maturing into a fully fledged river……until, of course, it spills out into the North Sea, and is no more. There’s probably a deeper meaning and purpose to such journeys along rivers…..but then I’m only a ‘bear of very little brain’ who likes to turn pedals. 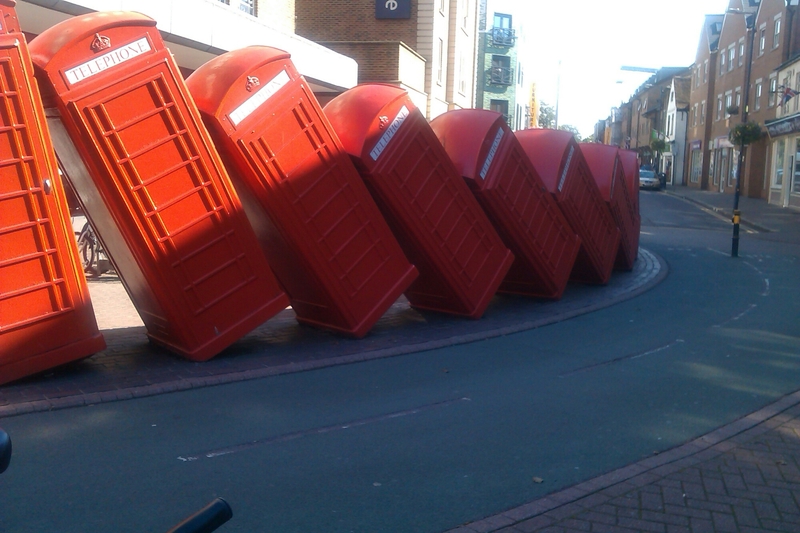 I’ll leave you to ponder the subtleties…….. In the world of off-roading (or rough-stuffing, as we used to call it), we say that 10 miles of rough tracks are the equivalent of 20 miles on road. Let me now add a piece of homespun wisdom of my own…..the same equation works for urban cycling too. Your expended effort is roughly doubled, and your average speed is usually halved. A combination of crowded roads, crowded cycleways, traffic lights and sundry street furniture, all conspire to frustrate your progress. ….then we crossed over to the north side of the River on Putney Bridge, and we desperately needed some sustenance; but long stretches of the river front in these parts are completely occupied by residential and office blocks. You’d be pushed to find food outlets or cafés between Putney and Vauxhall Bridges. Eventually we made a stop in a friendly ethnic cafe south of the river, and treated ourselves to a comfort sugar-rush with a knickerbocker glory….nostalgic memories of childhood immediately kicked in. 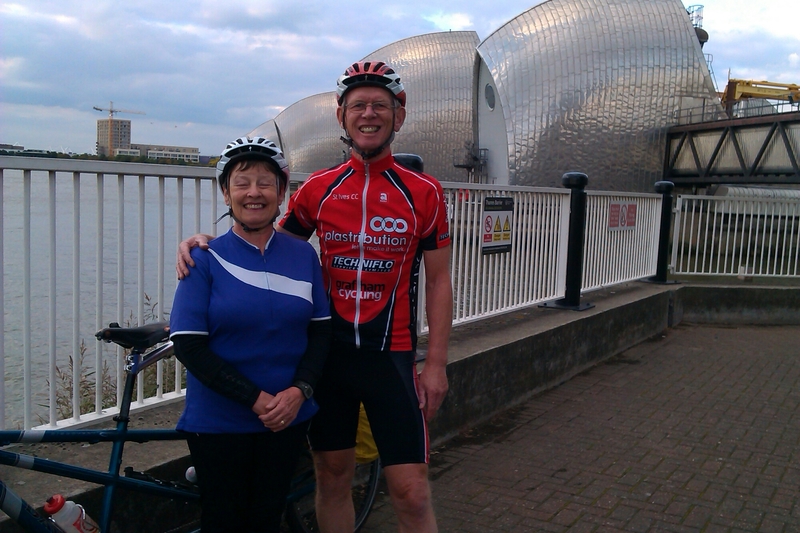 And at 6pm in the evening, with both energy and daylight fading, we hugged each other in front of the Thames Barrier, and a kind Ecuadorian couple took the photo that would become our personal little ‘gong’ for having completed the 184 miles (295km) of Old Father Thames. And to celebrate, we had booked ourselves into the Devonport House Hotel, a rather elegant listed building that formed part of the Naval College in Greenwich. Virtually straddling the Greenwich Meridian, and next door to the Cutty Sark, we enjoyed a meal and the company of my youngest brother and his partner, and relaxed after a testing day crossing the capital. 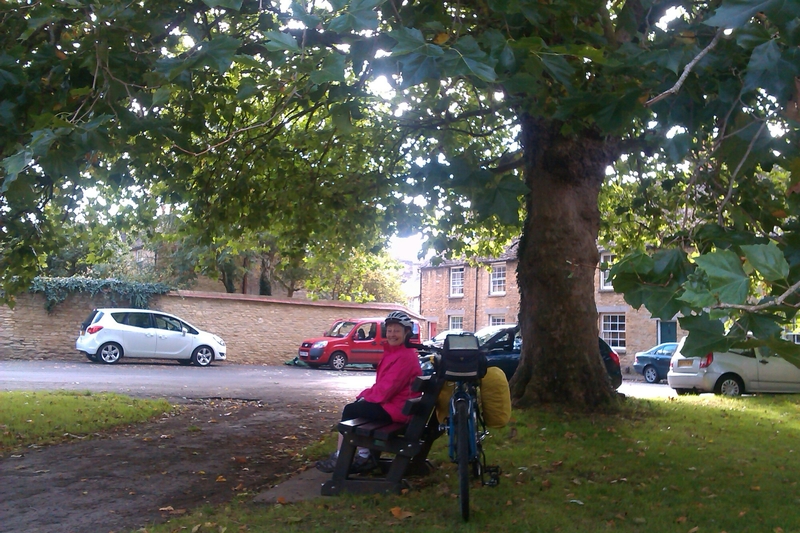 As we left our Travelodge in Horton, near Heathrow Terminal 5, I was struck by the leafy greenness of the ‘country lanes’ around Heathrow….green fields, sparse housing, relatively little traffic..no wonder Heathrow is being targeted for a second runway. 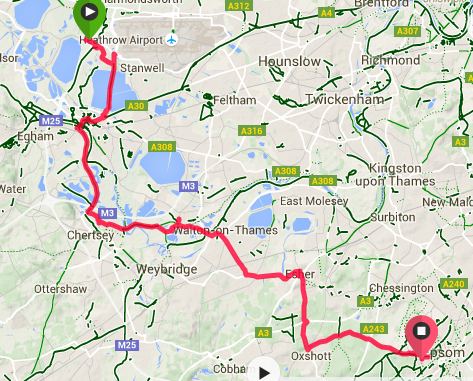 Look carefully at the first few miles of our route….. crossing the big reservoir to the SW of Heathrow truly tested the ‘pedalo functionality’ of the tandem! We headed on through Staines, Walton on Thames, Chertsey, Shepperton (of the famous studios), Esher (boasting the greatest percentage of detached houses in the country) and onto Epsom (famous for its salts and Derby). 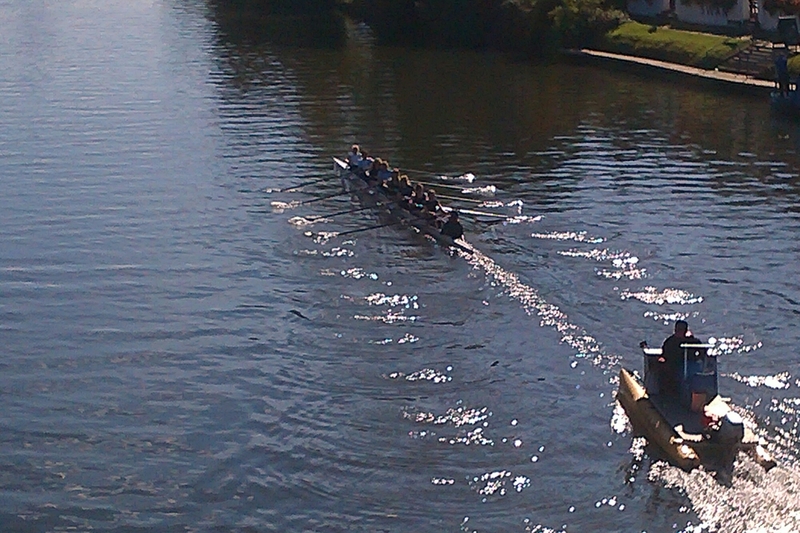 The River treated us to glimpses of quintessentially Thames scenes like this….. But we had to leave the river temporarily, and head further south to Epsom, and an unmissable opportunity to stay the night with one of my four brothers and his wife. He is not only a fanatical golfer, but an excellent cook…..so how else does one go armed with a present for the table? Having a brother who is a ‘golfing gourmet’ can lead to a variety of puns……..and his potatoes had to be served as ‘wedges’, of course! A delightful escape route from Reading took us along the Thames path, mingling with other cyclists and walkers, zipping past houseboats moored to the riverbank……but, sadly, riverside tracks seldom lend themselves to comfortable tandem riding. Too many obstacles and tight turns, which are negotiable on solos, but are difficult on a tandem…..which meant mounting and dismounting at frequent intervals, slowing down the pace to little faster than walking speed. and the almost complete absence of other human beings. 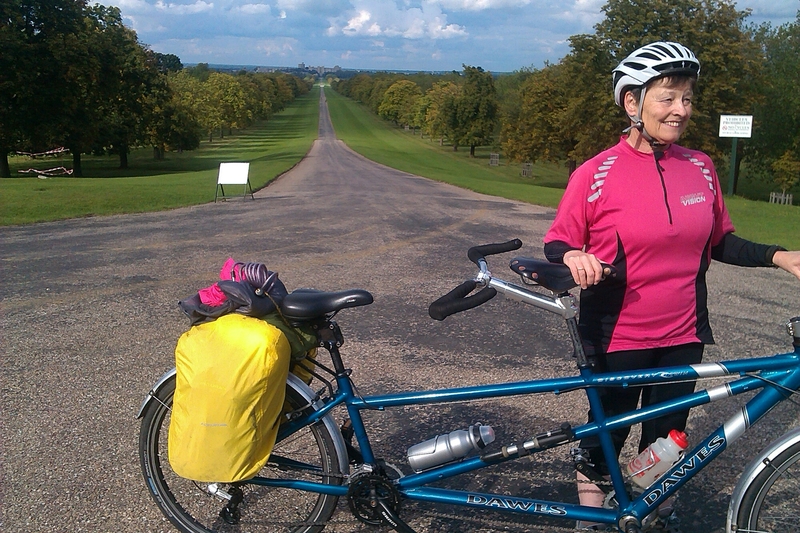 If you’ve never walked or cycled across Windsor Park, put it on your short list. 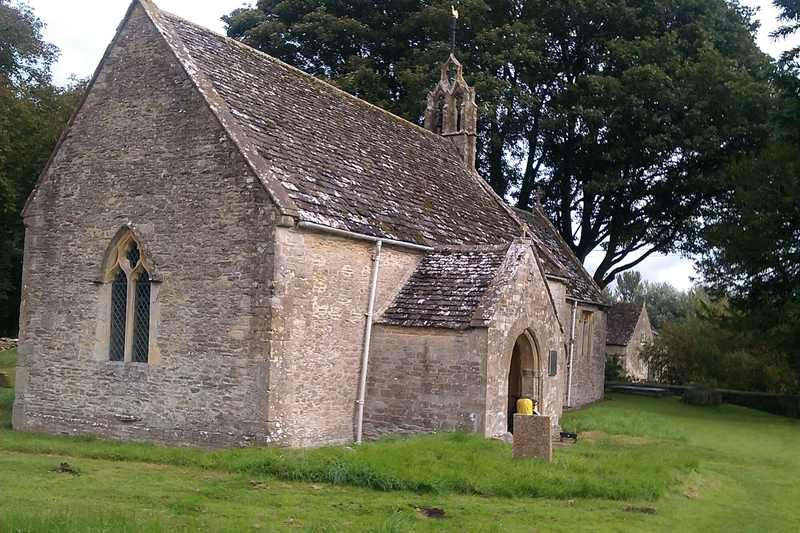 Then off in search of the site where, 800 years ago, a charter was agreed and signed by King John, in the presence of his rebellious barons……..
an action that would engrave the terms of universal human liberties on the constitutions of every democratic country, most notably that of the USA. 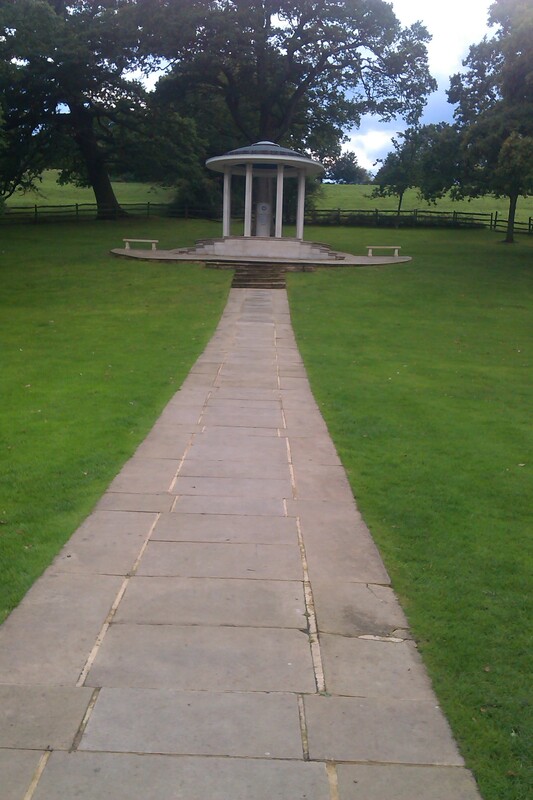 I am, of course, referring to Runnymede and the signing of Magna Carta, where a dignified covered monument bears witness to that event…..
….now accompanied by a very recent addition of 12 chairs called The Jurors, set out in the open field, seemingly awaiting a gathering, and each bearing depictions of world-changing events that should give us cause for reflection. 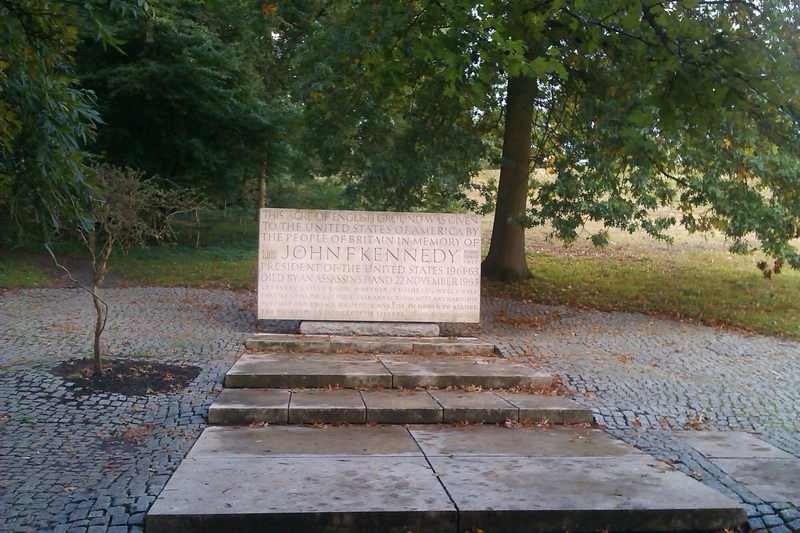 A quick visit to JFK’s memorial, set at the top of 50 stone steps, completes this homage to universal civil liberties. 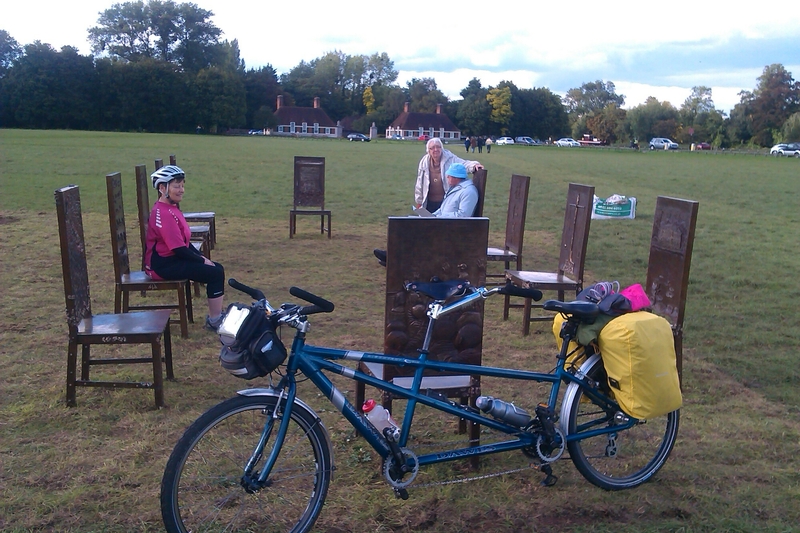 With heavy rain threatening, we jumped back on the tandem and sped off in search of shelter, refreshment and a bed for the night. 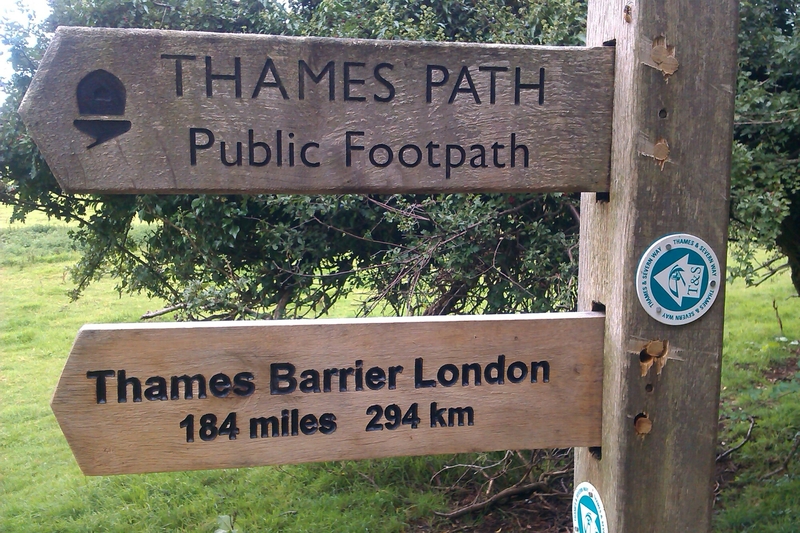 Our route along the Thames, from source to Barrier, is based on a couple of naive assumptions: that heading downstream will, by and large, be a downhill experience….but let’s pretend the Chiltern Hills aren’t there; that the predominant westerly winds will always be at our backs…..except of course, when it blows from the east (and it did yesterday); that the tandem, after careful preparation and mechanical checks, is unlikely to let us down…..except, of course, when it does, and then almost terminally. Climbing our first steep hill into the Chilterns, I tried to engage our lowest gear, and the chain jumped the largest rear sprocket and became (almost) irretrievably jammed between wheel and cassette. It took a huge amount of brute force to free it, potentially breaking both spokes and chain, and wrecking the gear hanger….but, fortunately, none of that happened, so plan B was not called into action (ie. how to extract two people and their unserviceable tandem from a remote spot in the hills). Once over the Chiltern Ridge, it was an exciting descent towards Reading, to be reunited once again with ‘Old Father Thames’, now massively wider than just 50 miles upstream, and in full flow. 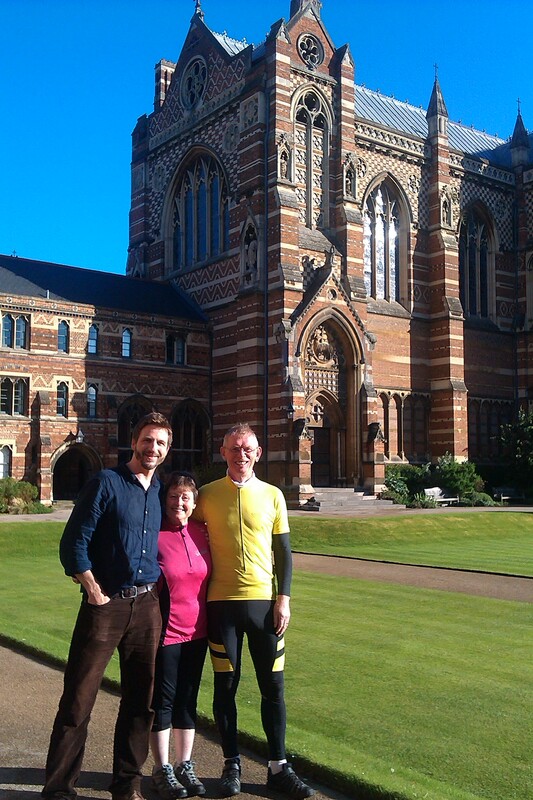 and descended into Oxford supremely happy at our good fortune. The deluge came later than predicted…..but it came, nevertheless. 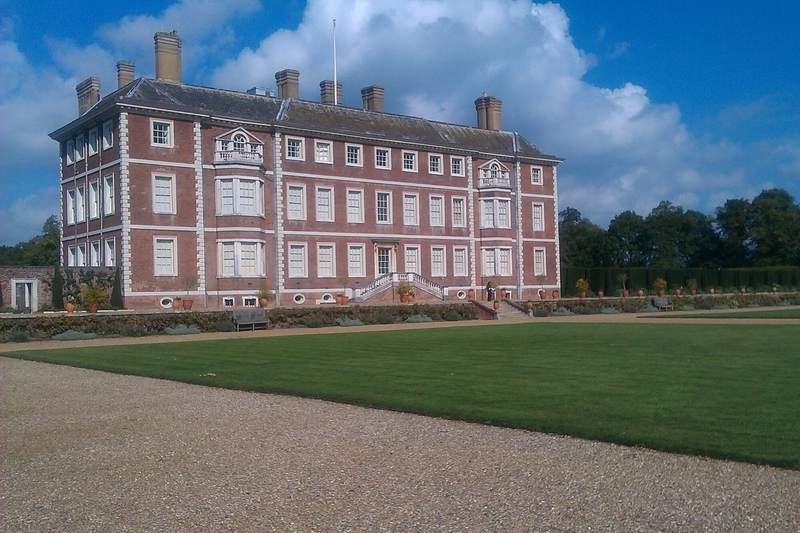 We checked into our accommodation, but this was no ordinary affordable B&B on the fringes of town. 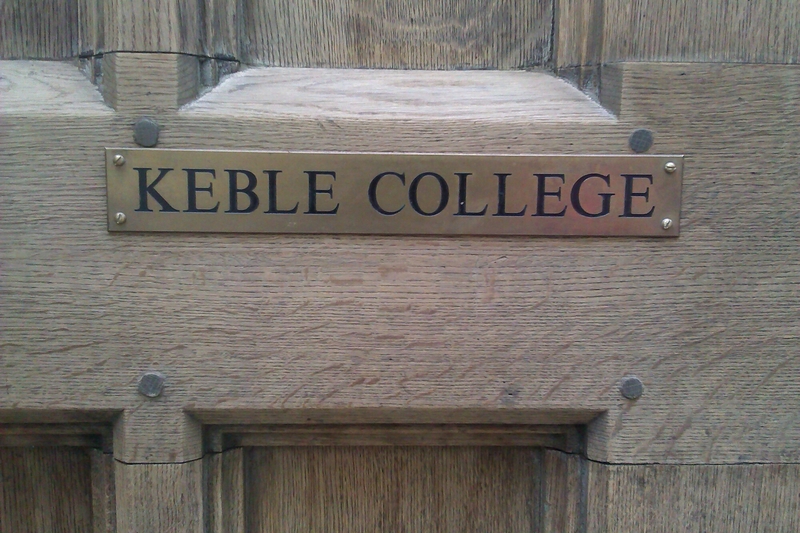 This was in the heart of the city, as guests of a friend and former pupil, now doing research at Keble College. Jenny looking like meat in the sandwich! 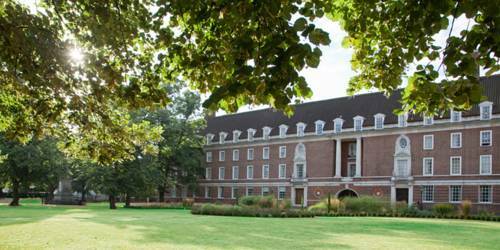 Yes, we had the privilege of a room in College, dining in the Fellows Common Room with Tom, and spending a few hours at the Ashmoleum Museum. A great way to spend a night in the city of dreaming spires. 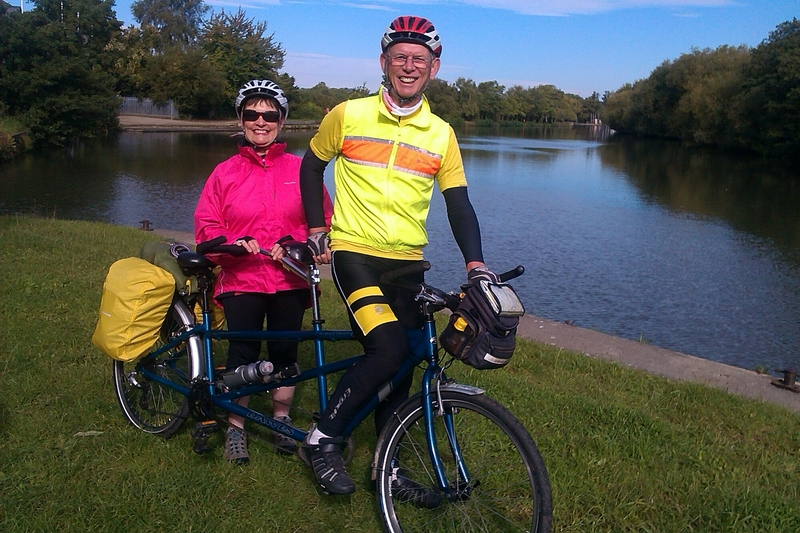 “What?…..riding the Thames on a tandem?” someone retorted. 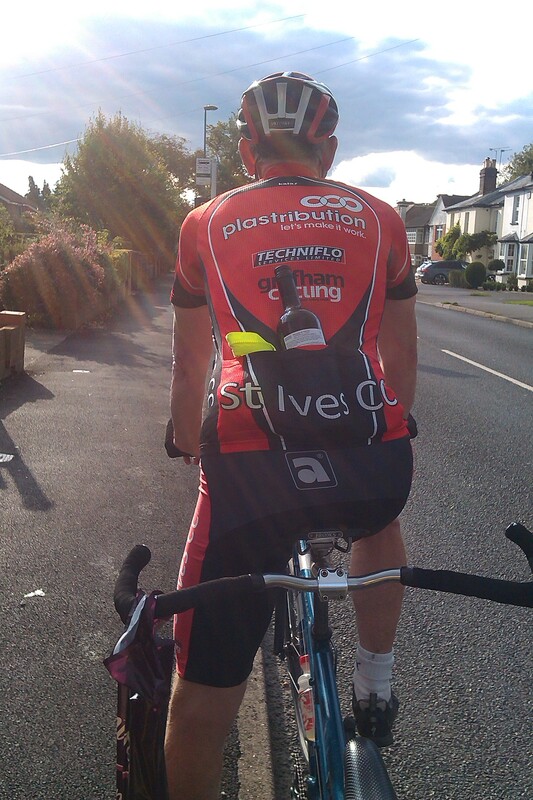 “Yep, we’ll just pump a few more pounds of air in the tyres, and go with the current….kind of pedalo style”. Joking aside, our first task was to find where the source was. Hard enough in late summer after so little rain, but even harder when there are several differing theories about the true location of the rising of the Thames. Even the biggest rivers in the world develop from totally unspectacular beginnings….usually a bare trickle from the earth, or a mere dripping from a rocky outcrop. But the Thames was being especially unspectacular this summer. 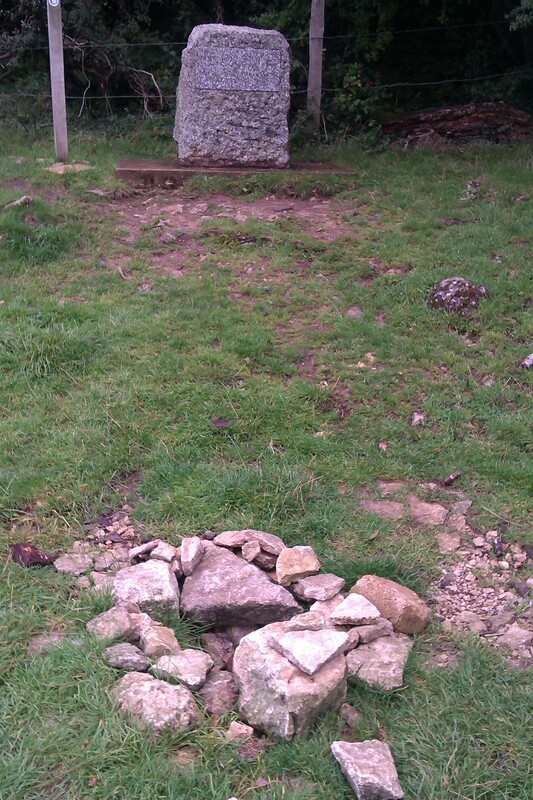 Marked only by an illegible stone marker and a few rocks, the source was notable by its total absence. 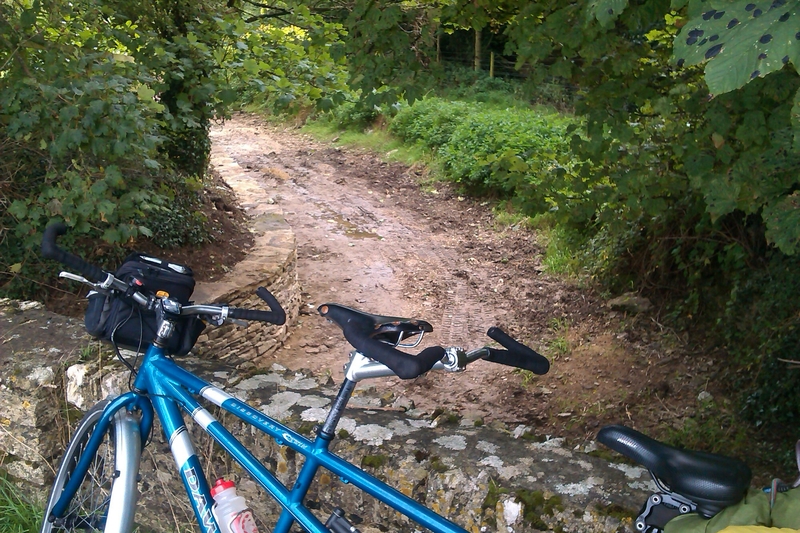 For three, four, five miles or more….the river bed was still ‘running dry’. to spend our first night in Lechlade, an ancient ‘inland port’, due to it being located at the highest navigable point on the river. 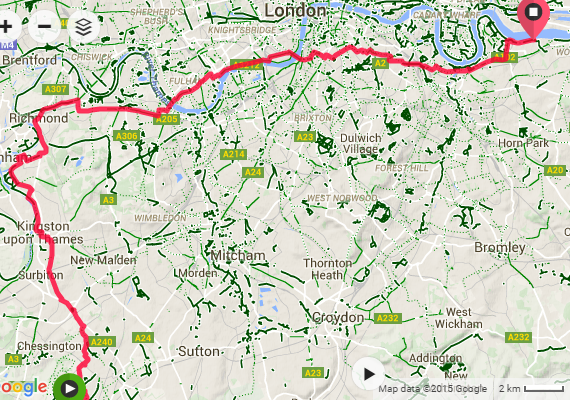 We have embarked on a mini-adventure riding the 184 mile length of the river, as far as the Thames Barrier. It will be a journey of companionable discovery, stopping in village community cafés, checking out heritage properties just off our route, and catching up with friends and family over convivial meals.